Good to know that they taste good but I have a couple in the fridge that I have not yet tried but was curious about. They ARE everywhere. They are like the new LARABAR. 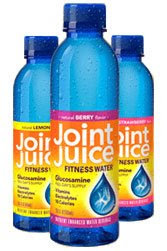 they had joint juice at a race i ran in december...it was okay, but we kept kidding about the name, like are you supposed to drink it or smoke it?